The Fantastic Four 2 was awarded a June, 2017 release date way before Fantastic Four bombed in theaters this past August. And ever since the movie crashed and burned, we've heard various rumors about what 20th Century Fox wants to do with that release date. Some believed it would go to Deadpool 2. Others believed that The Fantastic Four 2 would still happen, only this time under X-Men: Apocalypse director Bryan Singer, who hinted that a X-Men/Fantastic Four Crossover Movie may happen. 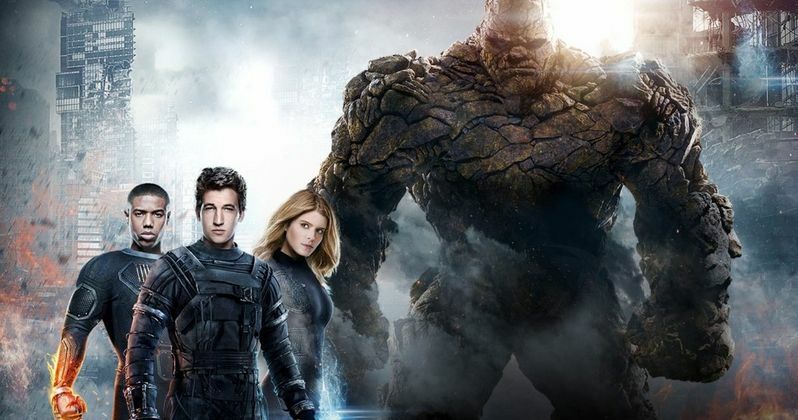 But now, producer and writer of the Fantastic Four reboot, Simon Kinberg says that Fox doesn't quite know what to do with the sequel, and that's all still being figured out. Most believed that Fox was going to dump the franchise, which has the possibility of moving back to Marvel just as the studio's Daredevil did. Is Fox seriously considering spending more money on what is now the second biggest bomb of 2015? In the end, the first reboot is reported to lose the studio between $80 to $100 million. That's not small change. Fox's president of domestic distribution Chris Aronson has already publicly stated that the studio is not giving up on the characters just yet. And Twentieth Century Fox is in the process of building its own shared Marvel universe. Simon Kinberg wants to see the sequel happen. But he doesn't know how that will move forward. Simon Kinberg is also the writer of X-Men: Apocalypse, and claims to be far too focused on making that sequel the best it can be to go back and look at the wreckage left by Fantastic Four. Speaking with MTV, he explained that his current work on X-Men: Apocalypse is eclipsing everything else. And he hasn't had an opportunity to fully reflect on this summer's disappointing returns for Fantastic Four. "I was obviously disappointed. I was most disappointed that fans didn't like it. I care more about them than I do anyone else. But I haven't done a full deep dive on it. Do I think it was unfairly treated? I don't know. I've been on plenty of happy movies that don't turn out to be very good movies, I've been on a lot of unhappy, difficult sets that turn out to be great movies. There was a lot of attention on the process of making that movie. It's hard, when you're making a movie, movies are hard to make. It's just the reality. Every time you make a movie, you want to make a great movie. It's a ton of time and effort you put in. We made that movie in the sweltering heat of summer in Baton Rouge and I was there every day of photography. You're waking up every morning being like, I want to go make a great movie. It was an opportunity to do that. I do believe there is a great Fantastic Four movie that we've made with that cast. So I'm gonna figure out what that is." Simon Kinberg's comments are a little ambiguous. Does he plan to salvage the original with a director's cut? Putting back some of the pieces that are missing to maybe make it more worthwhile? Or does he simply mean he's going to look at the good in the movie, and form a better sequel around those ideas? About Fox moving on with the sequel, the writer and producer had this to say. "We're figuring out what that movie would be. I'd like that to happen." Simon Kinberg has a multi-year deal with Fox to help produce and oversee the studio's upcoming Marvel movies. On the horizon are three X-Men movies set for release next year. These include Deadpool in February, X-Men: Apocalypse in May and Gambit in October. Wolverine 3 is planned for 2017, with The New Mutants and X-Force to follow, though neither of those have a release date. And there has always been much talk about the X-Men/Fantastic Four Crossover Movie. Some have been left wondering why Simon Kinberg has been left in charge of The Fantastic Four 2, since no one liked the first one. It doesn't sound like any of the fans want a sequel, and he knows this. Add to this the fact that the man is also working on both the animated TV series Star Wars Rebels and a Star Wars Anthology movie, you have to wonder if someone else shouldn't step in and take over The Fantastic Four 2 at this point. Some speculate that Marvel and Fox may team up to make another Fantastic Four reboot, in a deal that would be much like Marvel and Sony and their joint Spider-Man remake planned for 2017. Most fans don't think the superhero family can exist on screen without help from Marvel, or an assist from other Marvel characters. And a deal would actually help Marvel in the long run, as Fox has the rights to a lot of aliens that Disney isn't able to utilize, Galactus being at the forefront of that conversation. What do you think? Should Fox do The Fantastic Four 2? Or should the franchise be put to rest until someone really knows how to reboot it?